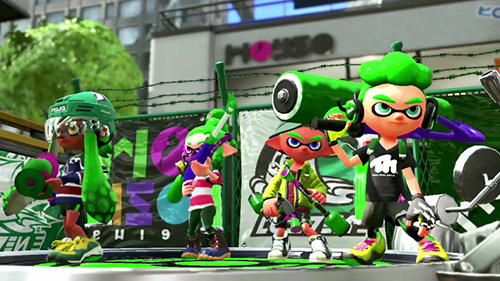 Splatoon was Nintendo's well-received venture into the world of shooters but with a family friendly spin. At the big Nintendo Switch Press Conference we had gotten our first look at the follow up to Splatoon, which would include the original maps, characters, and weapons with Splatoon 2 -- a big goof on their part by not naming it Spla2n. 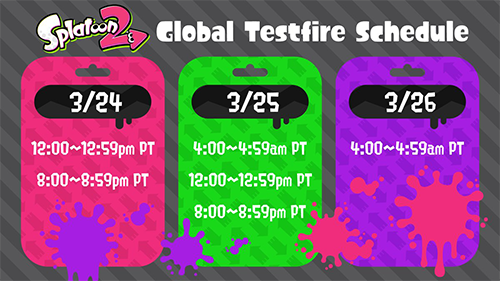 At that same announcement of Splatoon 2, Nintendo announced the Splatoon 2 Global Testfire for March 24th. This is Nintendo's odd attempt at a beta but there are a few changes from the status quo. Most modern betas will run in a small window of a few days or weekends and when it's done it's done. Splatoon 2's Global Testfire will begin on March 24th and run in small one hour chunks. Here's a look at the entire schedule. The original Splatoon had a few of these gameplay sessions. If the sequel is anything like the original game then it is likely we'll get our shot at playing a few different game modes. Make sure to take a good look at the schedule because these are some brief sessions that aren't any longer than an hour. If these 3 days don't fit your schedule you'll more than likely be able to hop onto a future beta, though it hasn't been officially announced by Nintendo. The original Splatoon was surprisingly well received for a shooter by Nintendo. Here's what critics had to say about the game. "There’s nothing else quite like it, nor the cathartic dopamine jolt to be had when you squid-skim up a paint-smeared quarter pipe, an Inkzooka at the ready, leap over the edge, take aim with your weapon, and reduce a startled opponent to goo." "The game's single player is surprisingly in-depth for a title that has been marketed as a multiplayer game, combining elements of platforming and shooting in a style of game that reminds me of Ratchet & Clank or Jak & Daxter." "It's a wonderful game with charm and inventive ideas that work and pave the way for new experiences in an otherwise stale category of games." "Despite being a tad rocky in the online department, and admittedly it’s a pretty big department of the game, Splatoon really stands out as a title to own. Never before has a shooter been taken a direction that puts just as much emphasis on the environment as the people that are in it." If you're looking forward to getting your chance to play Splatoon 2 Global Testfire you can download it now on Nintendo Switch's eShop in preperation for the March 24th launch. Have you played through the original Splatoon? Are you planning on trying out the game on the Nintendo Switch? Share your thoughts below!